The Rotary Club of Downtown Boca Raton is pleased to announce the Inaugural Boca Raton Mayor’s Ball honoring the elected officials who exemplify Rotary International’s motto, “Service Above Self” and the City’s visionaries past and present who have elevated the community. The black-tie gala will be held at Broken Sound Club on Saturday, October 17, 2015, with an sumptuous epicurean dinner and live music provided by the Steve Chase Band. Funds raised through the event will support the health and wellness needs of nonprofit organizations in the City of Boca Raton through the Rotary Club’s formal grant application program. The “George Long Awards”, named for the City’s first appointed mayor in 1924 whose devotion to the Boca Raton was renowned, have been established and will be presented to an individual and an organization that have championed the tradition of bringing indelible visionary ideas to Boca Raton. The Rotary Club Downtown Boca Raton Mayor’s Ball Committee in collaboration with distinguished Honorary Advisors will receive nominations and select the award recipients. The event’s Honorary Chair is Mayor Susan Haynie. 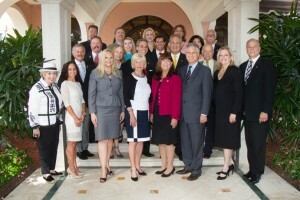 Honorary Advisors include former mayors Honorable Susan Whelchel and Honorable Steven Abrams, who currently serves as a Palm Beach County Commissioner; Boca Raton Deputy Mayor Robert Weinroth; Former Deputy Mayor Constance Scott; and Council Members Michael Mullaugh, Jeremy Rodgers and Scott Singer. Under the leadership of Co-chairs Kari Oeltjen and Jon Kaye – and following the lead of Fort Lauderdale and Palm Beach, where Mayor’s Balls have been annual events for several years – the Rotary Club Downtown Boca is excited to bring such an event to Boca Raton. “The Mayor’s Ball is a tribute to those who have made this community the best it can be and the generosity that continues to make a difference in the lives of so many,” said incoming Rotary Club Downtown Boca President Jon Kaye. “In collaboration with Mary Csar and the Boca Raton Historical Society we envision the Mayor’s Ball as opportunity for participants to enjoy and enhance their appreciation of the City’s history and bold visionaries,” said Co-Chair and Rotary Club of Downtown Boca Raton founding member Kari Oeltjen. The black-tie gala will be held at Broken Sound Club on October 17, 2015, with an exclusive epicurean dinner and live music provided by the Steve Chase Band. Funds raised through the event will support the non-profit organizations in the City of Boca Raton through a formal grant application program. Boca Raton Mayor’s Ball committee members include: next year’s co-chairs: Penny Morey and Lewis Fogel –along with Carole Boucard, Deborah Freudenberg, Alan Kaye, Linda Petrakis, Robin Trumpeter, Tracy Clark, Marleen Forkas, Ingrid Fulmer, Ken Kaylor, Dr. Ron Rubin, Janice Williams, Frank Feiler, Rick Howard, Brian Long, Howard Tai and Michael Walstrom. A Host Committee is in formation. For sponsorship and underwriting opportunities as well as ticket reservations, visit www.rotarydowntownbocaraton.org or contact Deborah Freudenberg at 561-299-1429, email Deborah@thefreuds.com.